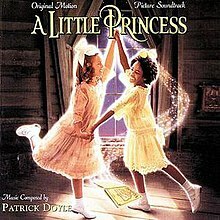 A Little Princess is a 1995 American family drama film directed by Alfonso Cuarón and starring Eleanor Bron, Liam Cunningham (in a dual role), and introducing Liesel Matthews as Sara Crewe with supporting roles by Vanessa Lee Chester, Rusty Schwimmer, Arthur Malet, and Errol Sitahal. Set during World War I, it focuses on a young girl who is relegated to a life of servitude in a New York City boarding school by the headmistress after receiving news that her father was killed in combat. Loosely based upon the novel A Little Princess by Frances Hodgson Burnett, this adaptation was heavily influenced by the 1939 cinematic version and takes creative liberties with the original story. The film was critically acclaimed and given various awards, such as two Academy Award nominations for its significant achievements in art direction and cinematography, among other aspects of its production. Sara Crewe (Liesel Matthews) is the kind and caring daughter of Captain Richard Crewe (Liam Cunningham), a wealthy aristocrat living in India. Sara's mother died along with her unborn daughter when she was very young, and she has to leave her beloved childhood home and friends when her father volunteers to fight for the British as an officer in World War I. Captain Crewe enrolls Sara at a girls' boarding school in New York, and instructs the headmistress Miss Maria Minchin (Eleanor Bron) to spare no expense making sure his daughter will be comfortable while he is away. He has reserved her the school's largest suite, and gives Sara a special locket of her mother's picture, and a French doll named Emily, telling her that if she wants to talk to him, just speak to Emily and he will hear it. Though she finds the strict rules and Miss Minchin's harsh attitude stifling, Sara becomes popular among the girls, including the scullery maid Becky (Vanessa Lee Chester), for her kindness and strong sense of imagination. She writes constant letters to her father, which are a great source of happiness for him on the battlefield. Due to a body being misidentified, Captain Crewe is declared dead when he is actually seriously injured and suffering from amnesia, and the British government seizes his company and assets. When Miss Minchin hears the news, she is in the middle of throwing a lavish birthday party for Sara, hoping to extort more money from her father. When Crewe's solicitor arrives and tells her there will be no more money, Miss Minchin is furious. Since Sara is now penniless and has no known relatives, Miss Minchin decides to move her to the attic with Becky to work as a servant where she will report to Mabel (Peggy Miley) at 5 a.m. Miss Minchin also confiscates most of Sara's personal belongings, including her locket, as compensation for her financial losses. Meanwhile, the elderly neighbor Charles Randolph (Arthur Malet) has received word that his son John, who is also fighting in Europe, is missing in action. He is asked to identify a soldier suffering from amnesia, but he is discouraged to discover it is not John. His Indian assistant Ram Dass (Errol Sitahal) encourages him to take in the man anyway, reminding him that he may know what happened to his son. Though her life is bleak, Sara remains kind to others and continues to hold onto her belief that all girls are princesses. Sara and Becky later play a chimney prank on Miss Minchin after she scolds a young chimney sweep boy (Jonás Cuarón). Sara even shows sympathy toward Miss Minchin's sister Amelia (Rusty Schwimmer). Ram Dass, who lives in the attic of the Randolph house, is brought to notice Sara and Becky by the household's monkey, and hears Sara telling imaginative stories to Becky. He mentions the girls to his employer, saying he would like to make some of their imaginings come true. When the girls later sneak up to visit Sara and are caught by Miss Minchin, Sara protects her friends by saying she invited them. As punishment, Miss Minchin locks Becky in her room and assigns Sara to perform both Becky's and her own chores for the next day without anything to eat for both of them. She even taunts Sara over believing she is still a princess. But when Sara stands up to Miss Minchin, saying that all girls (including herself) are princesses despite their miserable lives, she angrily threatens to throw her out into the street if she's seen with the girls again. After Miss Minchin storms out, to distract them from their hunger, Sara and Becky imagine a huge banquet, with themselves warmly and attractively dressed, and a pleasant fire burning in the grate. The next day, they wake to find the dream has come true, having secretly been brought over by Ram Dass. Later that night, Amelia sneaks out of the school and runs off with the milkman. When Miss Minchin notices Sara's locket is missing (having been stolen back by the other girls as a gift to Sara), she goes to Sara's room and confronts her in a rage. After she discovers all the finery left by Ram Dass, Miss Minchin accuses Sara of stealing everything and summons the police. With Becky's help, Sara narrowly avoids arrest by perilously climbing over to the Randolph house. Having failed to catch Sara, Miss Minchin insists the police arrest Becky for interfering with them. While hiding from the police, Sara comes across the soldier and realizes he is her father. Captain Crewe, though sympathetic to the girl, does not recognize her at all. As she tries to make him remember, Miss Minchin and the police arrive with Ram Dass and Mr. Randolph. Though Miss Minchin clearly recognizes Crewe, she falsely claims that Sara has no father and commands the police officers to seize her. As the police are about to take Sara away along with Becky, Crewe suddenly regains his memory with help from Ram Dass, and rescues his daughter. Miss Minchin angrily walks away in defeat. Some time later, Captain Crewe has cleared things up with Miss Minchin's superiors and the bank. The boarding school is given to Mr. Randolph, and his efforts make it a much happier place for the girls. The Crewe family's wealth is restored to them and they adopt Becky. Captain Crewe tells Mr. Randolph his son died in a gas attack, giving the man closure. As retribution for her cruelty to Sara and Becky, Miss Minchin loses her current title and high position and is reduced to a chimney sweeper, now working for the chimney sweeper boy she previously mistreated (who appears to be enjoying his revenge on Minchin). The film closes with Sara and Becky waving farewell to their former classmates as their carriage departs from the school and the family begins their return to India. Liesel Matthews as Sara Crewe, the sweet daughter of Captain Richard Crewe. Eleanor Bron as Miss Maria Minchin, a cruel, selfish and heartless woman who runs a boarding school where Sara is enrolled. She is Amelia's older sister. Liam Cunningham as Captain Richard Crewe, Sara's devoted widower father. Liam Cunningham also portrays Prince Rama, a character from Sarah's story. Vanessa Lee Chester as Becky, Miss Minchin's servant who lives in the attic of the school. Taylor Fry as Lavinia, a vindictive bully who is bitterly jealous of Sara's wealth and popularity. Heather DeLoach as Ermengarde, a shy, insecure girl often bullied by Lavinia and Miss Minchin. Peggy Miley as Mabel, a cook that works for Miss Minchin. Rusty Schwimmer as Amelia, Miss Minchin's long suffering sister. Arthur Malet as Charles Randolph, a kind old man that lives next door to the school. He is loosely based on Mr. Carrisford. Errol Sitahal as Ram Dass, Randolph's servant who later befriends Sara. Alison Moir as Princess Sita, a character from Sara's story. Kelsey Mulrooney as Lottie, a volatile girl at Sara's school prone to tantrums and fits. All of the tracks were composed by Patrick Doyle. Three of the tracks feature soloists. The "String Quintet in C major Perger 108, MH 187" by Michael Haydn is also used in the film. The film also features the New London Children's Choir. 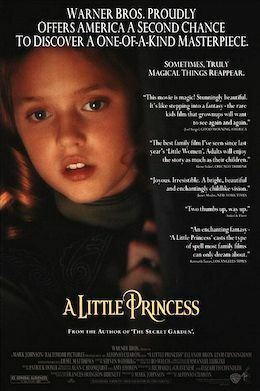 A Little Princess received critical acclaim from critics upon its release. On Rotten Tomatoes the film has a rating of 97% based on 32 reviews with an average rating of 8.2/10. The site's critical consensus states, "Alfonso Cuarón adapts Frances Hodgson Burnett's novel with a keen sense of magic realism, vividly recreating the world of childhood as seen through the characters." From the huge head of an Indian deity, used as a place where stories are told and children play, to the agile way a tear drips from Sara's eye to a letter read by her father in the rain, A Little Princess has been conceived, staged and edited with special grace. Less an actors' film than a series of elaborate tableaux, it has a visual eloquence that extends well beyond the limits of its story. To see Sara whirling ecstatically in her attic room on a snowy night, exulting in the feelings summoned by an evocative sight in a nearby window, is to know just how stirringly lovely a children's film can be. Rita Kempley of The Washington Post called the film Cuarón's "dazzling North American debut" and wrote it "exquisitely re-creates the ephemeral world of childhood, an enchanted kingdom where everything, even make-believe, seems possible ... Unlike most distaff mythology, the film does not concern the heroine's sexual awakening; it's more like the typical hero's journey described by scholar Joseph Campbell. Sara, the adored and pampered child of a wealthy British widower, must pass a series of tests, thereby discovering her inner strengths." A Little Princess was first released on VHS and LaserDisc on September 19, 1995 and was first released on DVD on November 19, 1997. Sarah... Ang Munting Prinsesa - a 1995 Filipino film adaptation of A Little Princess. ^ "A LITTLE PRINCESS (U)". British Board of Film Classification. 1995-09-14. Retrieved 2012-08-12. ^ Maslin, Janet (May 10, 1995). "Fairy Tale Doing a Child's Job: Reveling in Exuberant Play". The New York Times. Retrieved 2012-03-01. ^ Kempley, Rita (May 19, 1995). "'A Little Princess' (G)". The Washington Post. Retrieved 2012-03-01.